The bombing at Beirut's Iranian cultural center, Feb. 2014. This MEI Policy Focus seeks to address the Syrian war’s effects on Lebanon against the backdrop of exacerbated sectarian tensions and political-religious instability. The study first provides a brief background on the state of Salafism in Lebanon, followed by an assessment of the situation of the Sunni street at large. It then examines the wider implications that the Syrian war has had on Lebanon, namely the call for jihad launched in 2013 by Sunni sheiks around the country and the resulting burgeoning of relations between Salafis and Syrian military and radical organizations. The paper discusses the emergence of a new generation of Lebanese jihadis and also assesses the impact of the war on the thousands of Palestinian Sunnis residing in Lebanon. The study concludes by reflecting on the new political dynamic forming in Lebanon and its link with growing jihadism. The absence of a government strategy for dealing with the repercussions of the Syrian war will make things worse in a country already suffering from political fractionalization and sectarian strife. The following are recommendations that Lebanese groups and the Lebanese state can act upon in order to mitigate the effects of the crisis. Establish Refugee Camps As the conflict escalates in Syria, the Lebanese government should be under no illusion that the number of Syrian refugees coming into the country will stop growing. Establishing refugee camps in border areas would reduce insecurity to some extent by allowing security forces to better identify and control the activity of Syrian refugees. These camps, which would be under UN administration, could be built on the border with Syria. Local politicians have advocated the construction of these camps in the no-man’s land that separates Lebanon’s border from Syria. Abide by Dissociation Lebanese factions and Hezbollah need to abide by Lebanon’s dissociation policy from the conflict in Syria. Hezbollah needs to pull its troops out of Syria and rebuild trust with Sunni leaders in order to restore some sort of stability in the country. The party also needs to tone down its discourse toward the Syrian conflict to avoid inflaming a large part of the population. Dialogue between Hezbollah and moderate Lebanese and Palestinian Islamic factions should be reinstated in Sidon and elsewhere to defuse tensions. Reinstate Trust in Security Institutions Lebanese security institutions have been affiliated—rightly or wrongly—with local political parties such as Hezbollah. This paper has explained the decrease in trust between large swathes of the Sunni population and the military. Trust between military organizations and the local population, which fosters cooperation from the local community, is integral to the success of military operations in the current unstable security situation. The deployment of the army along borders, specifically in Ersal, is already a step in the right direction, as is the dismantling of Hezbollah’s positions that were initially erected to stem the flow of booby-trapped cars. Focus on Development Modern Lebanese history has shown that disenfranchised populations tend to be fertile ground for movements that can be used as proxies by regional powers. What the region needs is not only more army or police forces to protect its porous borders, but for the state to rebuild lines of communication and trust with the local population through developmental projects, such as road construction, improved sanitation and water systems, and an improved electrical grid. The state also needs to denounce the shelling of border regions by the Syrian army or rebel factions. The Syrian civil war is dividing society in neighboring Lebanon. The country, already cleaved along sectarian lines, is experiencing a period of instability that the Syrian conflict has further exacerbated. Inundated by refugees, unwillingly involved in the conflict due to Hezbollah’s defense of Bashar al-Assad’s regime, and lacking a serious application of state power, Lebanon’s remaining fragile balance is eroding. This precarious situation has given rise to a new generation of Lebanese Salafis and jihadis, who seek to inject Lebanon and Syria with their radicalized politics and reduce what they see as the disproportionately large influence of Shi‘a. Although this attempt would in more peaceful times no doubt be unsuccessful, Hezbollah’s military commitment to the Assad regime and the lack of a robust Lebanese state presence have left some Lebanese Sunnis feeling that they have no recourse other than extremism. This disturbing new trend also carries a geographic component: those radicalized in the north in cities like Tripoli tend to carry out jihad in Syria, whereas those from southern Lebanon, especially in Palestinian camps, are more likely to engage in suicide attacks, often within Lebanon’s borders. The polarization of Lebanese society resulting from the Syrian war has allowed radical Sunnis in Lebanon to play a more active political role and has facilitated the emergence of extremist groups in Lebanon. Comprehending the state of Salafism in Lebanon at the present is impossible without at least a cursory understanding of the longstanding religious and sectarian divisions that have formed the country’s current political atmosphere. Lebanon’s government operates according to a system of “confessionalism,” which allocates top governmental positions based on religious affiliation; the president must be a Maronite Christian, the prime minister a Sunni, the president of the National Assembly a Shi‘a, and so on. Confessional representation is such a delicate topic in Lebanon that no census has been conducted since 1932, lest the domestic balance of power be upset by demographic changes. Furthermore, the Lebanese government does not have a monopoly on the use of physical force within its borders; the Lebanese army is significantly less powerful than the Shi‘i paramilitary organization Hezbollah, which is based in southern Lebanon and holds seats in parliament. Hezbollah, funded by the Iranian government since its inception in 1985 and supported later by the Syrian regime, has recently inflamed Lebanese Sunnis by sending troops into Syria to support the embattled Assad regime. It is within this context that Salafism has grown in Lebanon, and violent jihad, once the province of extremist Sunnis outside Lebanon’s borders, has found a perch inside the country. Salafism, a branch of Sunni Islam, was founded in Lebanon in the 1960s by Sheik Salem al-Shahhal, father of Sheik Dai al-Islam al-Shahhal, one of the current leaders of the religious movement. Salafism advocates a strict and literal application of the Qur’an and a return to the practice of al-salaf, or “the predecessors,” referring to the Prophet Muhammad and his disciples. Salafism is based on three important principles: the belief in only one God; da‘wa, or missionary work; and jihad. Lebanese Salafi groups for the most part followed the quieter traditionalist branch of the movement and excluded the call for jihad from their practice until 2013. In 1989, Salafism expanded from its base in the north of Lebanon into other regions, namely the southern city of Sidon, when Dai al-Islam al-Shahhal, fleeing arrest by the Lebanese security services, found refuge in the Ain al-Hilweh Palestinian camp, from where he started providing lessons. Lebanese Salafis largely kept out of politics until the 2005 assassination of former Prime Minister Rafik Hariri, a moderate Sunni. In the political upheaval that followed, Salafis aligned themselves with a pro-Western bloc against the faction led by Hezbollah and aligned with Iran and Syria. Since Hariri’s assassination, Lebanese Sunnis have become more critical of Hezbollah. When five Hezbollah members were accused of the assassination at the Special Tribunal for Lebanon in 2011, Salafis supported the accusation. Sunni hostility toward Hezbollah increased further after the assassinations of three notable Lebanese Sunnis: police investigator Wissam Eid in 2008, Internal Security Forces General Wissam al-Hassan in 2012, and former Finance Minister Mohamad Chatah in 2013. “There was a feeling [among the Sunnis] that the secular movement did not respond to people’s expectations during this crisis, so people turned to the Islamic street, which was more vocal about the oppression of the Sunnis and denounced the arbitrary arrests of members of our community,” said Salafi Sheik Salem al-Rafei of Tripoli. In 2008, a government decision to shut down Hezbollah’s private telecommunications network and to remove Rafik Hariri Airport's security chief, Wafiq Shoucair, over his alleged ties to Hezbollah sparked clashes between Sunni and Druze militants on the one hand, and fighters affiliated with Hezbollah on the other. Other, multiple clashes in Tripoli pitting Sunnis against Alawites—who hail from the same community as Assad and are an offshoot of Shi‘i Islam—further stoked Sunni resentment toward Hezbollah and Shi‘ism. The forced collapse of Lebanon’s government in January 2011 also radicalized Sunnis, who were distressed over the fall of then-Prime Minister Saad Hariri, son of Rafik Hariri. This event dovetailed with the Syrian war. The Syrian uprising has been largely led by Syrian Sunnis waging war against a government headed by the Alawite Assad family, which ruled over Lebanon for 29 years and was a major ally and backer of Hezbollah. This history has given rise to “a feeling of victimization [among Lebanese] Sunnis, caused by an alignment of Shi‘i Hezbollah with the Syrian regime,” said Lebanese Salafi Sheik Adnan Oumama. This feeling translated locally with the progressive rise of tensions in Lebanon between pro-regime Shi‘a and pro-rebel Sunnis. Lebanon’s Salafis began holding rallies to show support for their coreligionists in Syria. Although Lebanese Sunni anger has increased in tandem with the Syrian civil war, it has translated to violent jihad only recently. Disenfranchised Sunnis, disappointed by their traditional leadership, supported the jihadi statements of rising Islamic leaders. This trend was most noticeable among the Lebanese youth residing in regions witnessing direct confrontation between Shi‘a and Alawites on the one hand and Sunnis on the other, such as Tripoli, Tarik al-Jdideh in Beirut, Sidon, and Palestinian refugee camps located in south Lebanon. Slowly but surely, the black flag inscribed with the Islamic profession of faith—often associated with jihadi groups—started appearing. Salafi sources believe that about 300 fighters have joined rebels in Syria, a number that a source from the Lebanese Ministry of Interior said was too low. “We believe this figure to be in the high hundreds, but we do not have accurate statistics,” said the source. The killing of over 100 Tripoli men alone in the fall of Qalaat al-Hosn in Homs in March 2014 hints at a much higher number. The flow of fighters has, however, been stemmed in recent months due to increased border control. In addition to sectarian divisions and the radicalization of the Sunni street, the Lebanese state’s unwillingness or inability to enforce order has greatly impacted the security situation in Lebanon. Aggravating the problem is the fact that when the army has intervened, its actions are often seen as harsh and based on partisan allegiances. A battle in June of 2013 in the suburbs of Sidon was reported to have involved followers of a Salafi sheik fighting the Lebanese army, a battle in which Hezbollah fighters were involved alongside the military. Seeing Hezbollah and the Lebanese army fight alongside one another greatly increased mistrust between the army and the Sunnis involved. Bassam Hammoud from the Islamic party al-Jamaa al-Islamiya noted that “certain power centers with[in] the security institutions have been infiltrated by political factions,” insinuating that Hezbollah has at least partial command of state institutions. Tense relations between the Lebanese army and Sunni populations are found mostly in Sidon and north Lebanon. In the past few months, attacks have escalated. In Sidon, a Lebanese army officer was killed in December 2013 when two army checkpoints were attacked, allegedly by supporters of Sheik al-Assir. On January 22, 2014, unknown militants launched three separate attacks from a suburb of Tripoli and targeted military vehicles in Tripoli. In late February 2014, a suicide bomber targeted an army checkpoint in the northeast Lebanese city of Hermel, killing two soldiers and a civilian. Despite the fact that the bomber killed Lebanese army soldiers, the Nusra Front, an offshoot of the al-Qa‘ida-affiliated group of the same name in Syria, claimed responsibility and stated that the attack was a reprisal for Hezbollah and Iran’s military involvement in Syria. This lack of faith in the Lebanese state is particularly evident in the towns of Majdal Anjar and Ersal, both in the Bekaa Valley bordering Syria. These towns face the problem of marginalization and mistrust toward the central government. The eruption of the Syrian war and the resulting exodus of Syrian refugees to Lebanon have only aggravated this issue. For example, Ersal is home to 40,000 Lebanese, yet is currently hosting over 100,000 Syrian refugees. Ersal residents seem to be more supportive of the rebel cause every day, as they are overwhelmed by the influx of refugees. Ersal has also been the target of several attacks from the Syrian army, but the Lebanese government has done very little to protect the local population. The collapse of Qalamoun and the trickling in of thousands of Syrian fighters further imperiled the situation in Ersal. However, the recent security plan implemented in the Bekaa Valley and in Tripoli seems to have contained the problem for now, as evidenced by the arrest of many local and Syrian fighters and heads of militias involved in attacks against the army. Within this rise in Sunni radicalism, a number of attacks have targeted Hezbollah bastions in the Bekaa Valley as well as in Beirut. In May of 2013, the first salvo occurred when two rockets struck a Hezbollah stronghold in southern Beirut. The rockets fell a few hours after Hezbollah leader Hassan Nasrallah vowed in a televised speech to help Assad gain victory in Syria. These attacks slowly escalated, and June of 2013 saw three separate roadside bombings targeting Hezbollah convoys in the Bekaa Valley. On July 9, 2013, a booby-trapped car exploded in a parking lot in the southern Beirut suburb of Bir al-Abed, wounding 53 people. The bombings multiplied, inflicting more casualties in August, when a car bomb struck southern Beirut, killing 20 people and wounding over 100. A Sunni group calling itself the Brigades of Aisha claimed responsibility for the attack and promised more operations against Hezbollah. A disturbing change in tactics then occurred on November 19, 2013, when bombings turned for the first time into suicide attacks. Two suicide bombings rocked the Iranian Embassy in Beirut, killing at least 23 people. A Lebanon-based Palestinian organization with links to al-Qa‘ida, the Abdullah Azzam Brigades, claimed responsibility and threatened further attacks unless Iran withdrew its and its allies’ forces from Syria. This suicide bombing was followed by several others claimed by the Nusra Front in Lebanon. 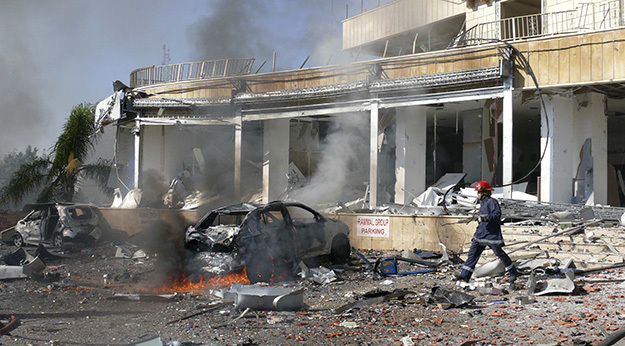 In February 2014, another dual suicide bombing targeted Iranian interests, specifically the Iranian cultural center in the Beirut neighborhood of Bir Hassan. The twin Iranian Embassy bombings and others are an indication of the rise of a new generation of suicide bombers. Interviews have shown that the Syrian cause has been at the core of the indoctrination process of most or all of these new bombers, many of whom are believed to have fought or spent time alongside the rebels in Syria before returning to Lebanon. While there are of course differences between jihadis who have fought in Syria and suicide bombers, they mostly show similarities in their youthful age, motives for fighting, and the experience they gained across the border. The emerging trend is also two-pronged: while Sunnis from the north appear to play for the most part a supporting role in terror attacks or in organizing networks of fighters to Syria, those hailing from the south and from Palestinian refugee camps, as well as Syrian nationals coming from Syria itself, seem to be spearheading suicide bombings. One Lebanese fighter who had been in Syria explained that the principal reason for this new generation of jihadis is “the defense of Sunni children and women who are being slaughtered by the regime and the party of Satan,”—a reference to Hezbollah. Another justification used by jihadis is that the best way to fight Hezbollah is to crush the Assad regime, which has “become the weak point of a chain formed by supporters of the velayat-e faqih [the Iranian theocratic system of governance].” Finally, some jihadis whose relatives had died were motivated simply by a feeling of vengeance. Two of those interviewed said that they each had at least one relative who had been engaged in terror activities and had been killed in Syria or Lebanon. With a few exceptions, most jihadis interviewed or whose names appeared in local newspapers hailed from the impoverished pockets of Tripoli and North Lebanon, or from Ersal, Majdal Anjar, Sidon, and the Palestinian camps. Recent suicide bombings in Lebanon show that the civil war in Syria is drawing Palestinian refugees living in Lebanese camps into a widening circle of violence. “Dozens of young men have been trained for suicide operations,” warned a Fatah source. Suicide bombing has been, since the 1980s at least, a foreign phenomenon in Lebanon, but the recent radicalization of Sunnis in Lebanon, especially those in Palestinian camps, seems to have reinvigorated this long-dormant trend. The February 2014 arrest of Naim Abbas, the Palestinian who allegedly masterminded many of the suicide attacks that targeted Hezbollah areas and purportedly contributed to the transfer of Syrian jihadis into Lebanon, is a case in point. “Abbas was a member of Islamic Jihad and is believed to have staged…attacks against the UNIFIL [United Nations Interim Force in Lebanon],” says a Palestinian source. Several reasons can explain this active role played by Palestinian refugees. Since the first Palestinian exodus in 1948, refugees have been contained in makeshift camps around the country. The discrimination they face in their ghettoized reality is exacerbated by the restrictions imposed on their choice of employment and freedom of movement. This volatile environment, as well as external factors such as the weakening of secular Fatah and the rise of Islamic groups, has shifted the power paradigm in camps in Lebanon to one marked by the growth of a new Islamist generation. Indeed, in the past two years, several clashes in the Ain al-Hilweh refugee camp have pitted the Fatah movement against radical Islamists. According to an anonymous Fatah source, these new radicals have links with the Nusra Front, which an Islamist source in the camp also confirmed. Palestinians refugees are also believed to act as a bridge between Lebanese radicals and Syrian radical organizations. According to military sources, “Palestinian camps are considered as operating rooms for the terror networks.” The new radical movement in Ain al-Hilweh, which is thought to be the heart of this network, is also relying on a new generation of jihadis between the ages of 17 and 25 who have little religious knowledge and subscribe to a Manichaean vision of the world, although some associated with the camp, such as Sheik Jamal Khattab, a main Islamist figure, deny such accusations. A similar phenomenon seems to be taking place in other refugee camps in Lebanon such as Burj al-Barajneh, Sabra, and Shatila, located in Beirut. Fatah sources believe that “sleeper cells have been established in these camps.” ( Interview with Fatah sources in January 2014. Palestinians also play a dominant role alongside Lebanese and Arab nationals in the Roumieh prison, considered after Ain al-Hilweh to be the second major terror breeding ground. “Many of the statements released by the Abdullah Azzam Brigades and taking responsibility for suicide attacks were released from the Roumieh prison,” says a military source. The presence of the Nusra Front in Lebanon, the Azzam Brigades, Fatah al-Islam, Jund al-Sham, and other radical Palestinian appellations seem to all point to one large nebula operating in Lebanon that shares political goals and ideologies. This paper underscores two separate dynamics taking place in Lebanon. In Tripoli, the Syrian street front that pits Sunnis against Alawites is one outlet for the anger of the area’s radicalized youth. Syria itself constitutes another front for the young generation of jihadis. But in northern Lebanon and Tripoli there is no direct point of friction between the Sunni youth and members of Hezbollah. This indicates that for now, at least, jihad in the north will mainly translate externally into joining the battle in Syria and internally into joining the battle against Lebanese Alawites. However, the closing of the borders and the fall of areas located close to Ersal and northern Lebanon such as Qalamoun and Qusayr has stemmed the flow of fighters into nearby Syria for now. The dynamics in Sidon in the south, as well as in the Palestinian camps, namely Ain al-Hilweh, are very different. Alongside Syria, the Ain al-Hilweh camp acts as an incubator for the radicalization process and the organization of terror activity, particularly suicide bombings targeting Hezbollah. According to two 2009 reports on poverty and living conditions by the Lebanese Social Affairs Ministry and the United Nations Development Program, the north constituted 53 percent of all poverty in Lebanon, the Bekaa Valley 29 percent, the south 22 percent, and Beirut below 6 percent. Since then, living standards have worsened with the entry of over 1.2 million Syrian refugees. Sunni populations in northern Lebanon and Ersal have become even more disenfranchised. However, poverty rates are not the only indication of these areas’ marginalization. In some regions, with the exception of military positions guarding the Syrian border, little can be seen of the Lebanese state. The passivity of the Lebanese army in the face of the Syrian army’s incursions and targeted attacks on northern Lebanon and Ersal has contributed to the erosion of trust in the state. In addition, the growing number of Syrian refugees is shifting demographics in favor of Sunnis and is contributing to the radicalization of both the Sunni and Shi‘a streets and the deterioration of the security situation. The state vacuum and the rising number of Syrian militants are allowing the Syrian crisis to further spill into Lebanon and strengthen radical movements. The situation described above has impacted relations between the Lebanese army and Sunni populations, mostly in northern Lebanon and Sidon. Distrust in military organizations has encouraged members of the local populations to direct their support to radical organizations instead of state institutions. In the current context, it is possible that attacks against the army could grow in frequency. However, the recent spate of bombing attacks may have been stopped for now, thanks to the formation of a new government that includes respected Sunni figures, which allows for a defusing of sectarian tensions and the launch of a widespread security plan endorsed by all political parties. In the absence of a true reconciliation process, though, any change in the current political relation among major players or a shift in the Syrian situation could bring the terror threat once again to the forefront. Interview with Sheik Salem al-Rafei, Tripoli, Lebanon, December 2013. Interview with Sheik Oumama, Sidon, Lebanon, January 2014. However, there was a phase of sporadic jihad between 2000 and 2007. This period was characterized by the confrontation between radical groups and the Lebanese army in the northern area of Danniyeh in the year 2000, and the 2007 Nahr al-Bared war between radical Salafis belonging to the group Fatah al-Islam and the Lebanese army. These events spearheaded the growing rivalry between radical Salafi organizations, on the one hand, and the state—more specifically, the Lebanese army—on the other, a rivalry that would be instrumental in defining future events in the Syrian war. “Clashes Escalate on Syria-Lebanon Border,” Al Jazeera, 24 April 2013, http://www.aljazeera.com/video/middleeast/2013/04/201342432350795154.html. Interview with Sheik Salem al-Rafei, Tripoli, Lebanon, May 2013. Nicholas Blanford, “Sunni Cleric Incites Gun Battle With Lebanese Army and Hezbollah,” Christian Science Monitor, 24 June 2013, http://www.csmonitor.com/World/Middle-East/2013/0624/Sunni-cleric-incites-gun-battle-with-Lebanese-Army-and-Hezbollah; Elias Muhanna, “Nick Blanford and Mitch Prothero Respond to Queries about Hizbullah Involvement in Sidon,” Qifa Nabki, 25 June 2013, http://qifanabki.com/2013/06/25/nick-blanford-and-mitch-prothero-respond-to-queries-about-hizbullah-involvement-in-sidon/comment-page-1/. Interview with Bassam Hammoud, January 2014. Mohammed Zaatari, “Officer, Four Gunmen Killed in Attacks on Army,” The Daily Star, 16 December 2013, http://www.dailystar.com.lb/News/Lebanon-News/2013/Dec-16/241231-officer-four-gunmen-killed-in-attacks-on-army.ashx#ixzz2r8mqfc1s. Misbah al-Ali and Antoine Amrieh, “Army Says Eight Soldiers Wounded in Tripoli Attacks,” The Daily Star, 22 January 2014, http://www.dailystar.com.lb/News/Lebanon-News/2014/Jan-22/244890-2-wounded-as-gunmen-attack-lebanese-army-in-tripoli.ashx#ixzz2r8lfCfaM. Rakan al-Fakih, “Two Bombs Explode in the Bekaa Valley, Miss Hezbollah Convoy,” The Daily Star, 29 June 2013, http://www.dailystar.com.lb/News/Local-News/2013/Jun-29/221975-two-bombs-explode-in-bekaa-valley-miss-hezbollah-convoy.ashx#ixzz2qm8NieVm. “53 Wounded in Car Bombing at Parking Lot in Dahieh’s Bir al-Abed,” Naharnet, 9 July 2013, http://www.naharnet.com/stories/en/89884; “Beirut Car Bomb Rips Through Hezbollah Stronghold,” The Guardian, 15 August 2013, http://www.theguardian.com/world/2013/aug/15/beirut-car-bomb-hezbollah-stronghold. Laila Bassam and Erika Solomon, “Suicide Bombings Kill 23 Near Iran Embassy in Beirut,” Reuters, 19 November 2013, http://www.reuters.com/article/2013/11/19/us-lebanon-blast-idUSBRE9AI08G20131119. Interviews with jihadis and Fatah sources, December 2013. Interview with Abu Horeira (nom de guerre), Tripoli, Lebanon, December 2013. Interview with Abu Ghurair, Tripoli, Lebanon, December 2013. Interview with Abu Omar, Mankoubin, Tripoli, Lebanon, December 2013. Interview with Fatah sources, Beirut, Lebanon, January 2014. Interview with Fatah sources, Ain al-Hilweh, Sidon, Lebanon, January 2014. Interview with Sheik Jamal Khattab, Ain al-Hilweh, Lebanon, January 2014. Interview with Fatah sources, January 2014. Interview with an officer in the Lebanese army, Beirut, Lebanon, January 2014. Mariam Saab, “Some 28 Percent of Lebanese Live Below Poverty Line – Study,” The Daily Star, 5 February 2009, http://www.dailystar.com.lb/News/Lebanon-News/2009/Feb-05/52975-some-28-percent-of-lebanese-live-below-poverty-line-study.ashx#ixzz2r8gO93qk.